By the third day of my romp around the Angeles Crest I was down to less than a dozen HPS peaks remaining in the area. Most of them were short, easy excursion, but a few entailed a good deal of hiking. The road to Pacifico from the west was closed for the season, but in looking over things the night before I had 'found' an eastern approach to Pacifico that could also be used to reach Bare Mtn, the most remote of the remaining peaks. Unfortunately the paved road along the Santa Clara Divide to reach the trailhead was closed about a mile from SR2. This would add a few hours hiking that I wouldn't have to do if the road was open, but it seemed a small price to pay. I spent the night parked at the locked gate just outside Camp Christian, one of several private camps along the road. I was up at 4a for an early start, and after dressing and breakfasting I was on my way at 4:30a. Another cold day was on tap with a reading of 38F as I left the van in the dark. It took just about an hour to hike down the road by headlamp, reaching the junction with the PCT shortly before the end of the road. I headed west on the PCT per the HPS directions, but had some trouble locating the use trail purported to be an eighth of a mile along the PCT. In fact I continued for perhaps a half mile along the PCT until I was sure I had missed the shallow saddle indicated in the guide, then backtracked, eventually finding a helpful duck some 40-50 feet off the trail. This led across a shallow gully before climbing the slope of the opposite hillside, all along guided by some key ducks, some of the more helpful ones I found all week. It was still before sunrise when I crested the ridge, marked by a pole with a triangular metal marker. It rapidly grew lighter out and I was able to forgo the headlamp, following my way along an old firebreak that runs north to the summit of Bare Mtn. Sunlight touched the tip of the summit when I was less than ten minutes away, my hope of reaching the top before daybreak not quite met. There was the familiar red can register at the summit though it was not particularly old, going back only a few years. It was still quite cold, probably below 40F, and I did not stay long enough at the top to cool down. I took pictures of nearby Pacifico and Hillyer, then made my way back down. I descended via the HPS route #1 which is said to go through a closed area for the endangered yellow-legged frog. I saw no frogs, nor water, nor even damp earth that might be friendly to frogs, but I did find a huge area in Pinyon Flats at the base of the mountain that had been used for some time in the past for shooting practice. More of a dump than prime habitat, from the looks of things. Back on the pavement I stopped to take a picture of the sign for Sulphur Springs. It was reported in the HPS guide that this had been mispelled "Sulpher Springs" by the Forest Service, but it has since been corrected. Rather than return to Alder Spring and take the road up to Pacifico from there, I found my way back to the PCT and decided to use that route to get me up half the mountain. The PCT is hardly a direct route, winding in and out of several side canyons as it makes its way up towards Pacifico, but the grade was pleasant enough. I followed the PCT to an elevation of nearly 6,000ft where it joins a saddle on Pacifico's SE Ridge. 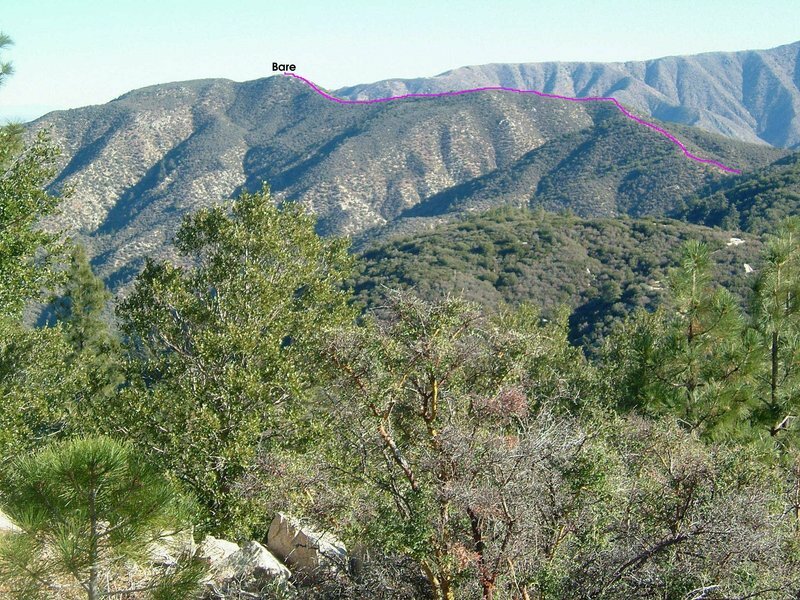 I left the PCT here, finding and following a ducked use trail that climbs steeply up the SE Ridge along what used to be an old firebreak or Jeep trail (as shown on the 7.5' topo). It took 45min from the saddle to reach the summit of Pacifico. The Upper Pacifico CG crowns the summit, offering an amazing view in almost all directions. The campground was closed for the season and I was the only one to enjoy the fine views this morning. The highest point is among some summit rocks found on the south side of the campground. The highest rock is class 3, most easily surmounted on the NE side (that's a bit of an understatement since the other sides look darn near impossible). A hole had been drilled in the top and a steel pipe cemented into it, to what purpose was not clear. A second, identical pole was affixed to another lower rock nearby. Normally adverse to litter, I was humored by the Pacifico bottlecap I found near the base of the summit. I placed this atop the summit rock, leaving it for the amusement of future visitors. Look around as I might, I was unable to located any semblence of a register, not that it would stand much chance of survival with the adjacent camground. Forest cover at the summit blocks views from that location, but after descending the top I walked around the campground to take pictures off to the west and north. I descended Pacifico via the same route along the old Jeep trail. Once back at the saddle I found my way down the south side almost 200ft to the Pacifico Mtn Road. Though well-graded, there was plenty of rock and other debris that had fallen upon the road since it was last cleared. It was hardly surprising that the road is closed for the season. I followed the road down to Alder Saddle where it met up with the paved road I had descended in the early morning. I hiked back up the road for fifteen minutes or so where I came upon Rosenita Saddle (the spelling on this sign could use some correction), the trailhead for Mt. Hillyer. Hillyer looks to make a nice mountain bike ride, evidenced by the numerous tracks leading up to its summit, but as a summit it is one of the weakest, even for the HPS list. It takes less than twenty minutes to reach the top, then another twenty minutes looking around for the highpoint. There are half a dozen candidates, none of them quite satisfactory as the highpoint, none of them offering much in the way of views through the forest cover. I did not manage to find the summit register as indicated in the HPS guide, but by then I was not really caring if I did or not. Sometimes they are more trouble than they are worth to maintain on busy, easy-to-reach summits. It was 11:45a when I returned to the van at Camp Christian. Now it was time for the bevy of easy peaks. First up was Mt. Mooney, another peak that could be excised from the list without significant loss. It took fifteen minutes to reach the summit and nine minutes to return. The rounded summit was covered in trees with no views to be had save to the west, a so-so view to Vetter Mtn. Second on the list was Vetter Mtn only a hundred yards south on SR2 from the Mt. Mooney TH. The road into Vetter Mtn was closed for the season, so it was necessary to hike several miles along the paved road. No big deal since the whole outing still took only an hour. The lookout atop Vetter was in excellent condition though of course it was also closed up for the season. The deck around the outside offered fine views, from Pacifico in the north to Mt. Baldy to the east, Santiago far to the south, and into Ventura County to the west. After retracing my route, the easiest peak of the week was next on tap, Mt. Sally. While I appreciate the good views to be had, the popularity of the peak seems to have spoiled it. I found discarded McDonald's trays near the ample parking area, used for sledding devices the previous winter. Lots of toilet paper and beer cans could be found alongside the use trail leading to the summit, and the crowning piece d' art was the disposable diaper lovingly tossed into a yucca plant. Car to car was only 15 minutes for the peak. This one should be struck from the list as well. The last of the four easy ones to be climbed in the area was Barely Flat, but as for the others I found the gate locked at the highway. I decided not to hike the 2.5mi up the road for another ho-hum summit and left it for another day. Driving north on the Angeles Forest Hwy, I headed for Mill Creek Summit and the remaining three peaks in the Pacifico area. To my surprise I found the road to Mt. Gleason open, and I quickly debated the merits of doing this drive-up with the remaining daylight I had. It was almost 2p and would certainly burn up at least half of the remaining day. I decided to do it while I could, even at the expense of covering the last peaks in the dark. The 9mi drive along the winding road took more than half an hour, with another half hour used in hiking the short distance to the summit from the parking spot. The views out to the west were truly sublime and well worth the drive. The shining waters of the Pacific Ocean were spread out for almost 100 degrees in that direction, with at least four islands off the coast visible as well. A array of seismic sensors crowned the summit, a nice placard explaining their purpose and hopefully discouraging vandalism. The oddest thing I noted near the summit was a bright copper cowbell affixed to a post alongside the road. I rang it a few times for grins, but could assign no purpose to its existence there. It was 3:30p by the time I had descended the road to Mill Creek Summit and driven a few more miles to the trailhead for Cole Point. The TH was a large clearing off the side of the highway, just past a shallow saddle in the road. With less than an hour of sunlight remaining I needed to make swift work of this peak to get back without headlamp. Though there is no maintained trail to the summit, the use trail is quite good with the exception of finding the start just off the highway. Once the initial discovery was made, it was a straightforward ridge climb some 1,600ft to the summit. I made good time, taking just fifty minutes to reach the top by 4:20p. The sun was only minutes from setting behind Mt. Gleason to the west. I quickly signed into the register, snapped a few pictures, and returned back down the use trail. It was 5p when I got back to the van, having used up just about all the available daylight. There were still two peaks to be covered, Emma and Old Emma, not far from where I was. I managed to drive the three miles to the next trailhead, finding the use trail off the side of the road just before things got too dark. These last two peaks were actually the most enjoyable ones of the whole day. The waxing moon was already high in the eastern sky and would provide ample light for the landscape. A fire had raged across these hills some time in the recent past, burning the few trees that grew here. While this might make for a stark landscape by day, at night it was a wide open view with the many lights of Lancaster and Palmdale easily visible in the desert below to the north. The moon was more than ample light to navigate by and I left my leadlamp off for the most part. It took about half an hour to climb to Mt. Emma, the higher of the two peaks. A register was tucked in a small cairn at the flat summit. The next segment was a long walk along the undulating ridgeline to Old Mt. Emma, taking nearly an hour to complete. I was bundled up against the night chill and the cold wind that blew in over the ridgeline. I stopped on the leeward side of the ridge when I was halfway across to place a call to my wife at home to check in and let her know I was OK. It was rather idyllic and I could have sat and chatted for hours while I watched the twinkling lights of the city below. Of course I probably would have cooled off considerably and started shivering, but the call lasted only a few minutes and I continued on. It was nearly 6:30p by the time I reached Old Emma. After signing the summit register in the rather large cairn found there, I followed a motorcycle track off the northeast and north sides of the mountain back down to the road below. I still had another 40 minutes to hike back up the highway to my van. I had planned to hitch a ride if possible, but there were no cars heading my direction though plenty in the opposite direction. Seems this quiet little road is an alternative commuter route from the LA Basin to the Mojave area. Based on comments below, it is clear I climbed Peak 5,420ft instead and still need to climb Mt. Sally - rats! That wasn't Sally you climbed! Based on your pictures, you didn't climb Mt. Sally, but instead climbed a high point about 1.2 miles to the east-northeast at 34°16'57.67"N 117°59'52.02"W.
Appears you parked at 34°17'5.66"N 117°59'33.43"W.
Hah! you are quite correct. As soon as I looked at the topo again it was obvious, based on the wide turnout I parked at. Good thing Sally is close to Barley Flat which I need to go back for as well. I'm sure glad I found this out now rather than *after* my visit to Barley Flat. Thanks!